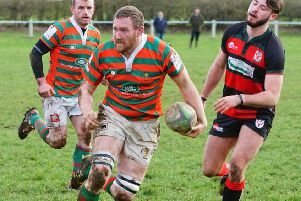 Lady luck deserted Market Rasen and Louth RFC as their search for a first Midlands One East league win of the season continued after a narrow home defeat. Their performance deserved a maiden victory as the Red and Greens went up a gear and showed a spirit and willingness to play heads-up rugby. But league position is bound to weigh heavy on the minds of players and there were instances of poor execution in the 22-20 defeat to Melton Mowbray. The visitors set the tone early on as their juggernaut forwards tried to bludgeon Rasen into submission. The incessant early pressure forced the hosts to concede a flurry of penalties, all of which were drilled into touch. But fortunately for Rasen, Melton’s lineout misfired and two chances went awry, while a brilliant steal from flanker Ben Chamberlin thwarted a third. From another penalty lineout, Melton quickly moved the ball to the opposite side of the field where Harry Wood charged up the touchline. Desperate defence halted his progress, but with Rasen’s defence filtering towards that touchline Melton shifted the attack back the other way as a long pass brought full-back Jack White into the line at pace. A further pass found Harvey Green in acres of space to cross the whitewash after nine minutes to open the scoring. Despite the undoubted pace in some of their backline, Melton continued to play a conservative game, relying on their forwards and the boot of fly-half Matt Cox to play for position. A quick tap penalty from Ed Nicholls caught Melton unawares and showed their vulnerability to a quicker tempo game. The young fly-half made good ground and after further recycling, Rasen were presented with their first chance of points when Melton conceded a penalty. Nicholls kick sailed wide of the uprights, but the visitors were almost caught out again when scrum-half Jack Noquet sniped through a hole close to a set scrum and was only just beaten to the touchdown of his own chip ahead. Rasen were growing in confidence, but wasted another chance when Spencer Holvey’s penalty kick to touch was overhit. Melton responded through their forwards, and a high tackle earned Jake Pryer a yellow card as the visitors built a head of steam. With Rasen a man light in the backs, Melton ignored the opportunities out wide and continued to employ battering ram tactics. The hosts battled valiantly to repel the onslaught, but the power of Charlie Loveday proved irresistible as he barrelled over the line close to the posts. Cox’s simple conversion gave the visitors a 12-point cushion at half-time. Rasen looked to up the tempo to throw Melton from their largely effective, but one-dimensional game plan, and while the visitors had much of the early possession, Rasen harried them at every turn. This paid off after 13 minutes when Melton dropped the ball in midfield and Peter Everton hacked the loose ball upfield. Rasen were much quicker to react and Adam Goodwin, making a welcome return after a long injury lay-off, surged up the touchline before flipping the ball back inside for Chamberlin to score under the posts. Tom Alldridge took over the kicking duties to land the simple conversion. Substitute prop Matt Ashton had an immediate impact as his powerful running brushed aside tiring Melton to eke out another penalty opportunity. Undeterred by his first-half miss, Nicholls took on the longer attempt and nailed it with aplomb to bring Rasen within two points. This clearly fuelled the youngster’s confidence and moments later he opened up Melton’s defence, aided by some clever dummy running. Once again Rasen’s support was too quick for Melton as play moved closer to their line. The hosts skilfully kept the ball alive for skipper Chris Mills to crash over. Nicholls sent the tricky conversion sailing through the uprights. But five minutes later Nicholls’ attempted chip kick was smothered by Chris Rose who ran in under the posts to leave Cox with an easy conversion to restore their lead. Two minutes later Melton skipper Marcus Badham was yellow-carded to throw Rasen a lifeline. Nicholls regathered his composure and held his nerve to slot the penalty to give Rasen a one-point lead with 10 minutes left. In a difficult season this was almost unchartered waters for the Red and Greens, but they appeared to be handling the situation calmly. Sadly, all the good work was unravelled with a minute to go when Rasen conceded a penalty. This time it was Cox’s turn to hold his nerve, which he did to slot the kick and cruelly dash Rasen’s prospects of a first win. Rasen: C. Starling, Alldridge, Southwell (Ashton), Mills, Crowe, F. Norton (J. Norton), Chamberlin, Scupham, Noquet, Nicholls, Stephens, Pryer, P. Everton, Pridgeon (Goodwin), Holvey. * On Saturday, the league programme reaches the halfway point when Rasen travel to Northampton Old Scouts who are just one place higher. Kick-off is 2.15pm.